As ministry leaders, we tend to want quick fixes. We put a lot of stock in reading a book and then making sweeping changes as a result. We like to go to conferences and come back with ideas on how to change our ministry strategy as we know it. To paraphrase a popular line, we want microwave successes in a crock pot world. 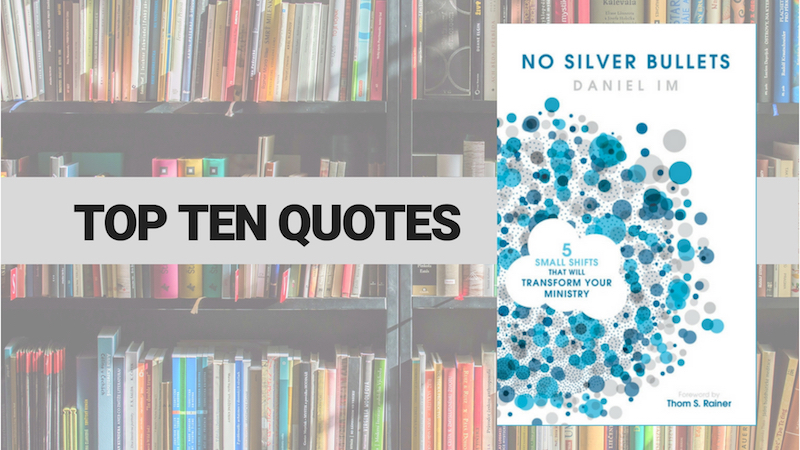 With a title like No Silver Bullets: Five Small Shifts that will Transform Your Ministry, you might think that author Daniel Im is advocating for overnight success. In reality, his book blows up the notion that anything in church world comes fast (besides VBS…I feel like that thing shows up every few weeks). Instead, he suggests that we change the way we typically think about discipleship, how we teach, and how we learn. …busyness without the right direction is poor stewardship. Adults learn best when they see a need for the content and can apply the information to their lives immediately. …discipleship, seen through a directional lens, is about setting our eyes on Christ and continually moving toward him. …small groups are as much of a discipleship environment as they are a tool to connect newcomers into community, care for members, develop leaders, and create a culture for multiplication. Since we often teach the way we’ve been taught and lead the way that we’ve been led, many of us are actually teaching, discipling, and developing adults using the methods that were used on us when we were children. To develop missionary disciples, you need to help your church see their primary vocation as being missionaries—wherever they live, work, and play—and their secondary vocation as being whatever they do to make a paycheck. …your church is a system, and it’s interconnected. So to think that you can introduce change quickly and easily, without it affecting the other areas of your church, is naïve at best. Serving God and others impacts spiritual growth. It influences an individual’s ability to consistently obey God and deny self, share Christ, exercise faith, seek God, build relationships, and be unashamed about one’s faith. Unless you can first identify and welcome newcomers, you will never be able to disciple them.